Cream the butter. Add the sugar, salt and vanilla sugar, beat briefly. Stir in the egg white. Gradually add the flour and almonds, mix by hand to form a dough, flatten a little, cover and refrigerate for at least 2 hrs. To shape, divide the dough into quarters. Roll it out in portions between a cut-open plastic bag to a thickness of approx. 4 mm. Loosen the dough with a spatula, cut out hearts (approx. 7 cm), place on two baking trays lined with baking paper. Cut the middle out of half of the biscuits using a smaller heart-shaped cutter (approx. 4 1/2 cm). Coat the open hearts with a little egg yolk and scatter with flaked almonds. Leave the trays to chill for approx. 15 mins. Bake each tray for approx. 8 mins. in the centre of an oven preheated to 200°C. Remove from the oven, allow to cool on a cooling rack. Dust the open hearts with a little icing sugar. 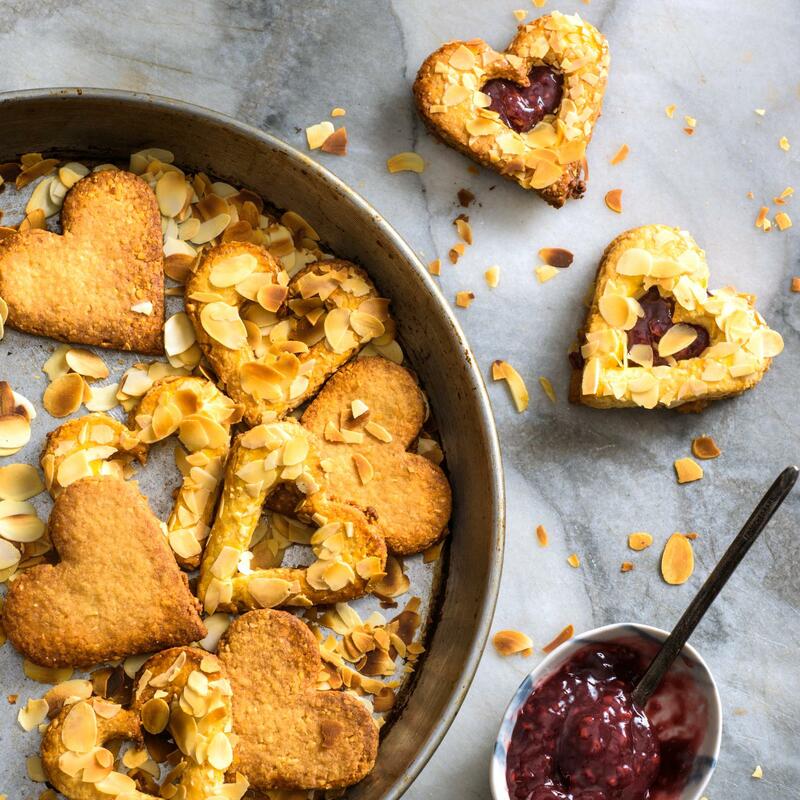 Combine the jam and raspberry schnapps, spoon onto the middle of the hearts (without almonds), cover each one with an open heart. Keep in an airtight tin for approx. 1 week.